Via San Lorenzo is the main street which links Porto Antico with Piazza De Ferrari. In the half way there is Chiesa San Lorenzo, the main cathedral of the city, with black and white stone stripes, a masterpiece of Gothic art, built on a pre-existing Romanesque site. The cathedral was elevated in 1098 on the remains of an existing church of the 4th century. 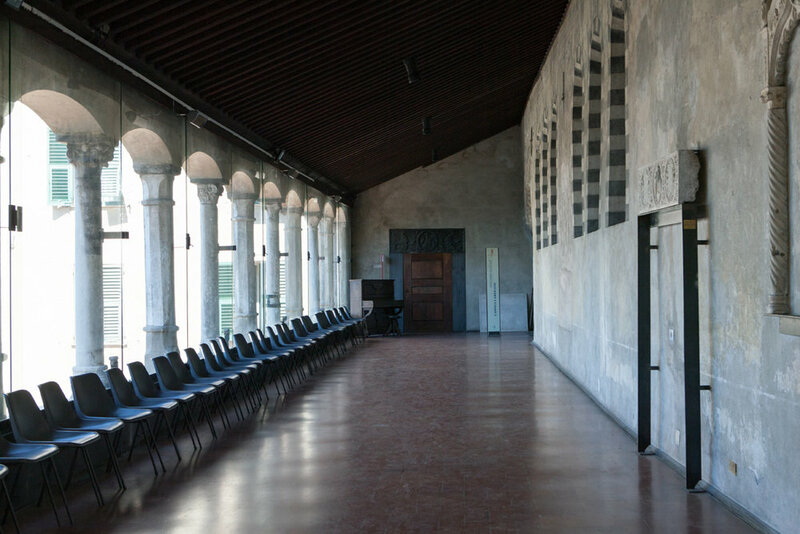 With the time the building went through complex interventions and renovationa, until it became a mixture of Romanesque, Gothic and Baroque elements. 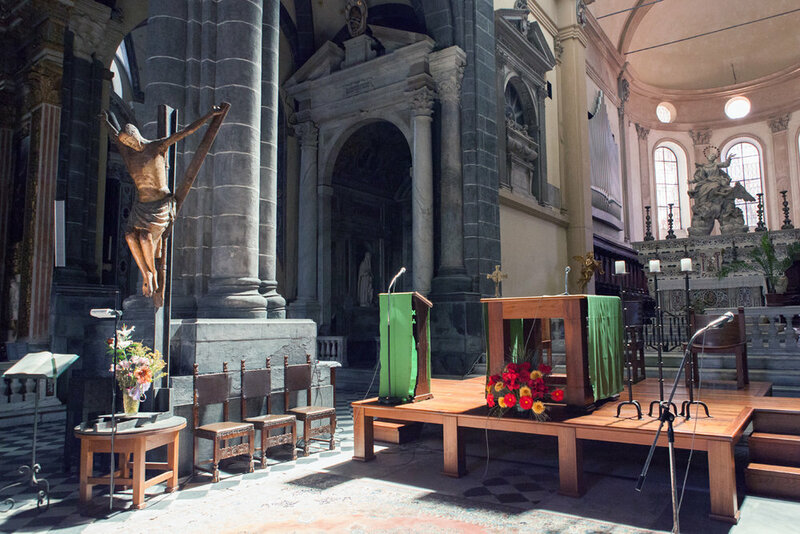 In the basement is the treasure of San Lorenzo with precious and very rare relics, among others the Holy Grail and the ashes of San Giovanni Battista, the patron saint of Genova. Curiously enaugh, during the naval bombing of February 1941, of the Second War World, a bomb felt unexploded inside the church, reinforcing the belive that the church is protected. Following Via San Lorenzo, in Piazza Matteoti, there is Palazzo Ducale, a landmark with an imposing neoclassical facade, the historic headquarters of dodges and now the city cultural centre. In the palace resided the Doges of the Genoese Republic from 1339 to 1797. After 1815 when Genoa became part of Regno di Sardegna, the function halls became public offices, while the southern wing, at one time destined to military force, was demolished to give space the opening of Via San Lorenzo. Throughout the time the palace undertook many modifications and restorations, that give to the building many architectonic styles. While the facade in Matteotti square is neoclasical, the lateral facade looking into Piazza de Ferrari is adorned with “trompe l’oeil” ornament, of flemish origin, very diffused in genoese palaces. The internal spaces give testimony to different restorations undertaken in diferent time periods. The most importante spaces are Salla del Consiglio Maggiore, Salla del Consiglio Minore, Torre Grimaldina, which is believed to be one of the wall’s towers of the 10th century, and served as political prison from 600’ until Fascist regime. Nowdays it is a place to visit, while the main halls are for conferences, exhibitions, social and cultural events. In the same square Matteoti, near Palazzo Ducale, is one of the oldest churches in Genova, Chiesa del Gesù, built in a Baroque style of 16th-17th century. The church originally dates back to the 6th century and later rebuilt in 1894. It houses one of the most beautiful ceilings in the city, gilded in gold and surounded by richly colored paintings of Rubens, Reni, and other Genoese master painters. I had the chance to visit the church in the sunset, and see everything illuminated by a golden glow. Following the narrow streets in the heart of the city there is a very nice square, Piazza Banchi, with small shops that sell flowers, second hand books and records. In front of Loggia del Mercanti (Mechants’ Loggia 16th century), which has been the first Stock Exhange Market in Italy in 1855, there is Church of San Pietro, erected on the outskirts of city walls in 862. After a fire in 1398 it was almost completely destroyed and in 15th century it was substituted by the palace of the Dodge Giannotto Lomellini. Following the plague of the 1579, it was decided by a public vote the construction of a new church, therefore the Lomellini handed over the palace to which only the top floors were reconstructed for the church, while the groundfloor continued as shops. Therefore the result was a singular mixture between the profane of the shops and the sacred of the church. The construction began in 1583. The church has a sole nave, with a large octagonal dome. The interior is decorated with precious stuccoes, paintings and sculptures by famous artists. 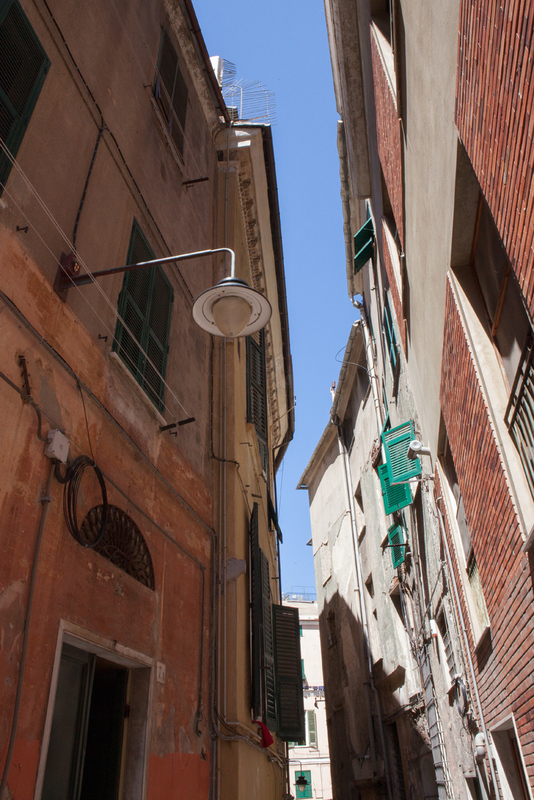 Following the narrow alleyways in the other part of the city, we arrive at Chiesa di San Donato (XIth-XIIth century). 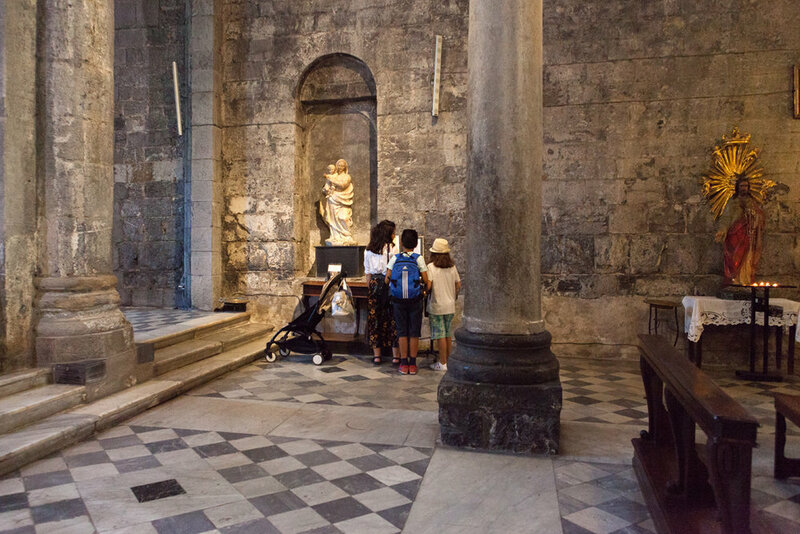 The church was erected in the antique city walls in 11th century, a period of strong economic and political recovery for Genova, and represents a splendid example of the genoese Romanesque style. In the following periods more elements were added, basically in the reconstruction of 1888 and 1925. In the interior the attention is drawn to the 6 columns (4 in granite and 2 in white marble) belonging to an original Roman temple, and other 6 columns with black and white strips belonging to Genoese tradition. In the inside there is a couple of columns representing human and animal figures and different pictorial works by flemish artists representing the influence of Antwerp school in the Ligurian culture of 16th century. Following the narrow alleyway, that goes up into Castello, we arrive at Chiesa San Maria di Castello, a Romanesque basilica of 12-15th century, which is considered the most important of the antique fortified settlement. Chiesa San Maria di Castello was built in 1100 and 1125 on the ruins of a former church of 600, and since the 15th century it was handed onto Dominicans who constructed the monastery and the new presbytery. The interior with three naves, is the result of different epochs; Romanesque naves and presbytery, 15th century lateral chapels, 15th century apse enlarged in 1589; materials of the Roman age can be identified in the columns and the capitals of the church, a sarcophague of the 3rd century, and the Miraculous Christ a medieval wooden crucifix. The church is placed side by side with the monastery provided with three cloisters, garden and water tanks. 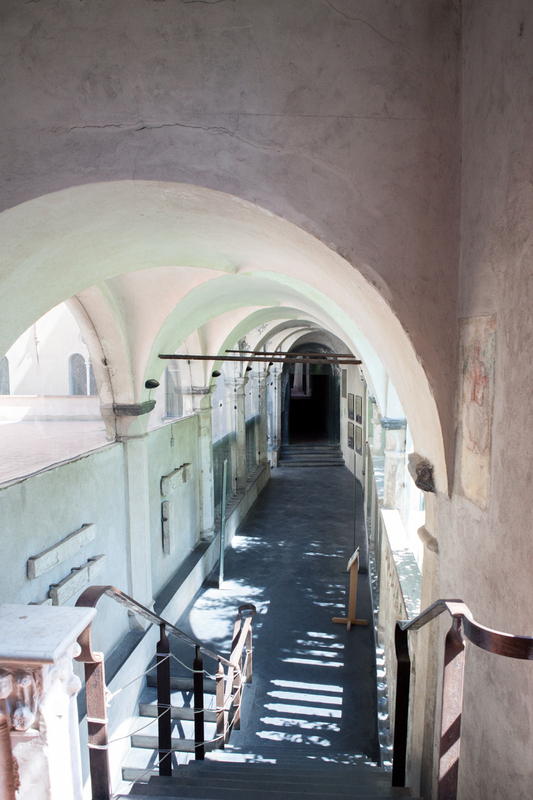 Since 2001 the complex is converted into museum and houses various masterpieces with original historic value.